Grounded by Papa Smurf (Mandy Patinkin) after they venture into the Forbidden Forest, Smurfette (Demi Lovato) and her brothers Brainy (Danny Puddi), Hefty (Joe Manganiello) and Clumsy (Jack McBrayer) feel disgruntled. Especially Smurfette. When she accidentally crosses paths with a mysterious creature, she convinces her brothers to defy Papa Smurf in order to join her on a quest. The young Smurfs have heard of the Lost Village, but weren't sure it actually existed. Now they believe the mysterious creature must have come from there. 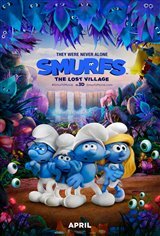 On their journey, they discover an enchanted place where female warrior Smurfs live and hasten to warn them about the evil wizard Gargamel (Rainn Wilson).